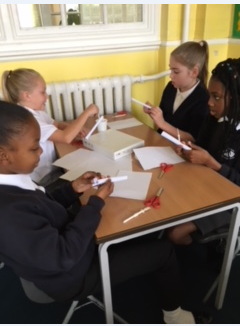 The children have settled into year 5 well and are all working hard! They had great fun making junk models of The Parthenon for our “Great, Bold and the Brave” entry point. Our Power of Reading book, Odysseus, links really well to our IPC topic and we have been learning all about this famous mythical hero. In October we will get to experience some of Ancient Greece first hand when we visit the British Museum. In Maths we are learning more about Place Value and going deeper into our understanding by looking at decimals and bigger numbers. Our swimming lessons have also got off to a good start. Year 5 have been doing lots of exciting learning this term. Our IPC topic ‘The Great, The Bold and The Brave’ took us to Ancient Rome, Greece and Persia at the British Museum. We met King Darius himself! We dressed up as Greek citizens and investigated what life under Persian rule would be like. We also had a visit from the “Magic Lantern” man who helped us understand Greek culture through looking at paintings and sculptures. In Maths we have been doing lots of work on Place Value, using the Concrete, Pictorial, Abstract model to deepen our understanding. We have developed our reasoning skills and are using mathematical vocabulary with confidence. In English we loved learning about the adventures of Odysseus. Recently we started an exciting new book called ‘Floodland’, which links with our current IPC topic – “Water for Everyone”. The book addresses the issue of global warming and imagines life in a flooded part of eastern England. We were pleased that so many of our parents and carers came to our “ Water for Everyone” Assembly and are looking forward to our Exit Point cake sale to raise money for Wateraid. 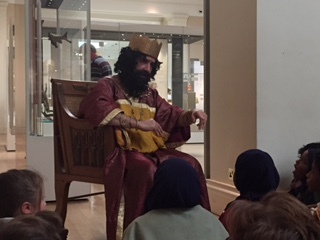 Learning about Persia from King Darius at the British Museum!